Kuwait’s oil era began on February 22, 1938, when oil was first discovered in Burgan field in the country’s southeastern desert. The very first well, aptly named Burgan No. 1, is still producing. Over the last 80 years, scores of other oil fields have been discovered across the country. Today, the Kuwait Oil Company (KOC)—whose primary role is to explore, develop, and produce hydrocarbons within the State of Kuwait—has thousands of wells and more planned to meet future production targets set in its 2040 Strategic Plan. At KOC, oil production begins at the well and extends through flow lines to preliminary processing facilities known as gathering centers. 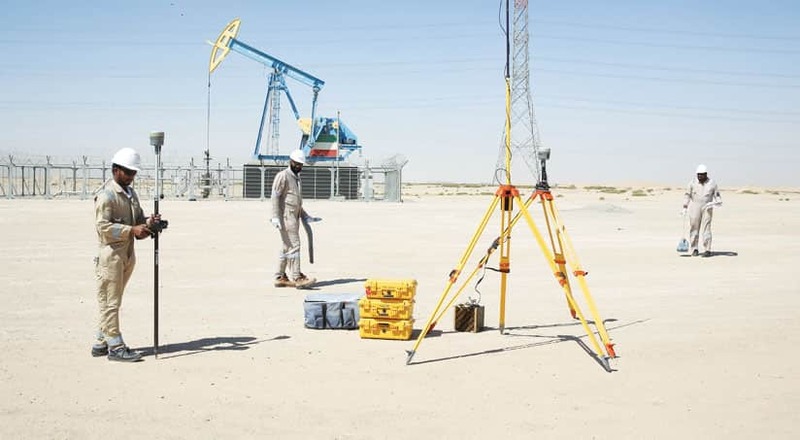 To get the crude out of the ground and to the 30 gathering facilities throughout Kuwait requires a profusion of infrastructure—cables, pipelines, communication lines, rig roads, fences, and shelters—both above and below ground. 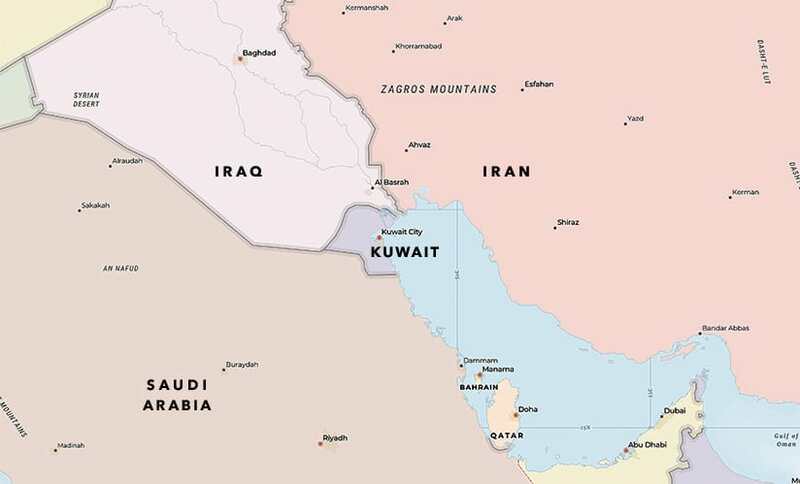 Kuwait is located on the southeastern border of Iraq. But the oil field infrastructure in Kuwait became congested out of necessity a few decades ago. When Iraq invaded its neighbor to the south in 1990, it resulted in tremendous damage to the oil fields. As Iraqi forces retreated, they set fire to 600 wells and destroyed 10 gathering facilities. After liberation, Kuwait needed to rebuild, and the fastest way to obtain the revenue to do that was to accelerate oil production. Given the scale of the damage, however, and the need to build facilities and ramp up production quickly, this extensive development project ended up introducing inefficiencies into the production process. KOC had to construct new pipelines, flow lines, and power lines around the oil lakes that formed when its facilities were damaged, so new development couldn’t follow the existing pipeline corridor. Thus, the amount of usable land on the oil fields was reduced, and subsurface development, including both exploratory drilling and drilling for production, was limited. To address this congestion, the operations technical services team at KOC formed an Infrastructure Master Plan (IMP) in 2006 that aims to decrease field congestion; keep track of land reservations and resolve conflicts; mitigate land encroachment; and comply with health, safety, and environmental regulations. The team uses GIS to administer all this, specifically relying on the ArcGIS platform to optimize future reservations for wells, pipeline routes, facilities, and more. KOC started developing the IMP by building a comprehensive and robust ArcGIS geodatabase that includes detailed geospatial and nonspatial information about all existing and proposed KOC assets. Initially, the IMP team—which consists of GIS specialists, GIS developers, GIS data management engineers, and AutoCAD drafters—designed the geodatabase so it featured a unified data model of all KOC assets. This required employing entity-relationship modeling to ensure that the conceptual representation of the structured data was well designed. After doing a thorough analysis of the model, the IMP team produced a database schema for it to define and describe the contents of the geodatabase. Next, the IMP team developed a highly integrated data collection technique for mapping assets that involves doing a topographic field survey of all KOC’s operational areas. Survey crews are equipped with survey-grade GPS receivers, as well as radio detectors and ground-penetrating radar devices that they use to trace both conductive and nonconductive underground features. Not only does this setup provide a controlled and reliable mapping solution, but it also ensures that the data conforms to international standards for spatial data accuracy. Kuwait’s initial oil find was in Burgan field in the country’s southeastern desert. 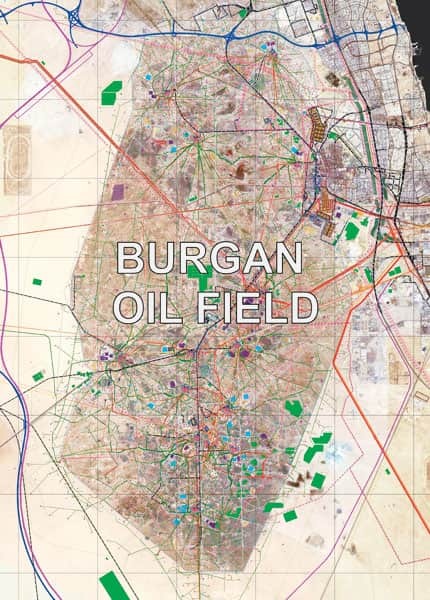 Its first oil well, named Burgan No. 1, is still under production. All known oil features are mapped, including aboveground wells, pipelines, manifolds, and buildings; below-ground pipelines and electrical and communication cables; and natural and man-made surfaces like bodies of water, oil lakes, and berms. Numerous feature attributes are recorded as well, such as the information on the metal tags attached to each KOC asset; details about the wells, like when they were built; the types of crude transported by particular pipelines; and pipe diameters. From there, the surveyors and AutoCAD supervisors on the IMP team process and edit the data in CAD format and then convert it to a Microsoft SQL Server geodatabase so it can be visualized in ArcGIS Desktop. The data is housed in ArcSDE, which allows many users to edit the geodatabase synchronously without locking features or duplicating data, thanks to its integral versioning capabilities. This extensive data collection, development, and implementation effort is giving KOC a large amount of highly accurate and up-to-date geospatial information about Kuwait’s oil fields and all the associated infrastructure. Now, this data is serving as the back end for the unique apps that the IMP team’s GIS developers are creating to help KOC employees enhance and even expand Kuwait’s oil and gas production. Prior to forming the IMP and adopting GIS, KOC followed an ad hoc site selection process without considering future needs and impacts. But with ArcGIS technology, the company is currently implementing a long-term land management program that will help it secure space for future development, in line with KOC’s 2040 Strategic Plan. Selecting a spot to put a new well is still quite complicated, though, due to ongoing congestion problems. When a new well is proposed, KOC geologists first determine the desired subsurface location for drilling. When these locations are overlaid on the crowded features, however, there are often conflicts. 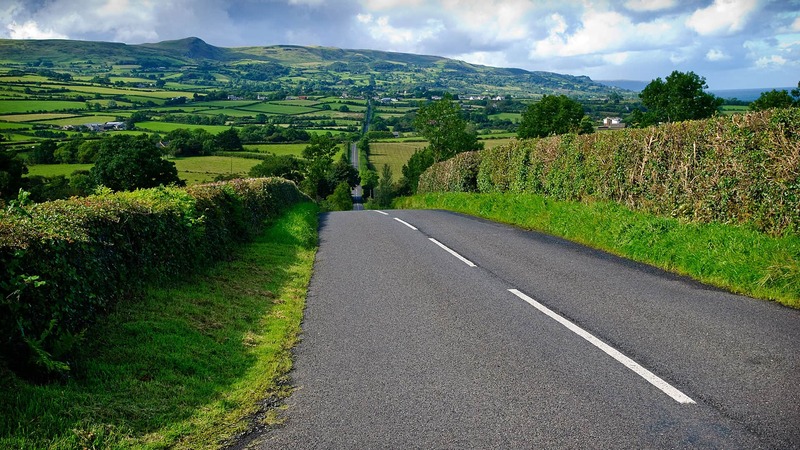 The process is further complicated by competing objectives, including costs, practicality, future development plans, operational and maintenance needs, and KOC’s rules that set spacing standards between features. To minimize these conflicts, the company has often had to find alternative locations—adjacent to where the oil is instead of right above it, for example—which end up being costlier. 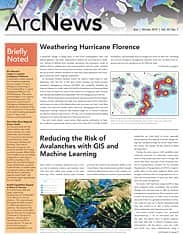 Now, ArcGIS Desktop streamlines the site selection process by employing geoprocessing tools and frameworks that help KOC secure quality locations for future wells, services, and facilities; optimize locations for better land management; and ensure compliance with environmental health and safety standards. Moreover, the operations technical services team relies on ArcGIS Desktop to evaluate KOC’s existing infrastructure layouts and propose cost-effective scenarios for reorganizing assets to ensure that land is used efficiently and economically in the future. Currently, the map document of KOC’s assets is published to ArcGIS Enterprise, where KOC users—ranging from field operators to senior engineers and team leaders—can access and employ it to help ensure the long-term success of land planning. To continue generating cost-effective approaches for land development, the IMP team plans to keep enhancing and centralizing its existing geodatabase and building apps to disseminate this vital information throughout the company. This will facilitate more collaboration and data sharing among teams, which will empower KOC’s leadership to make better decisions in a timely manner. As part of the Infrastructure Master Plan (IMP), survey crews collect data on oil production assets and verify features out in the field. Additionally, KOC is using digital aerial imagery and lidar data from Esri partner The Sanborn Map Company to create high-resolution, natural-color orthophotos and a digital terrain dataset that it can use to make 3D simulations of pipelines; do 3D spatial analyses of pipelines, gathering centers, and difficult-to-reach or dangerous areas; perform hydrologic modeling to identify potential (and unproductive) water-prolific areas; and better represent the terrain of oil fields overall. This remote data collection, which can be done quickly and on a more massive scale than survey-based data collection, not only reduces costs but also minimizes risks to humans having to map inaccessible, hazardous, and remote areas. KOC is centralizing its app development as well. Instead of making apps one at a time, on an as-needed basis, the IMP team will put them on a web portal where key company personnel can access the latest, most accurate information whenever they need it. This will enable users to find the maps and apps they want, enhance collaboration among teams, and make it easier to share GIS services and geoprocessing tools. The portal will also offer KOC’s attribute data via a unified, interactive, map-based interface. Other specialized GIS apps developed by KOC will support the needs of individual teams, including the crisis management group, the environmental health and safety division, and the team that optimizes pipeline routes. Likewise, the operations technical services team is continuing to integrate existing services that base asset management around real-time information. Having instant access to live data feeds about the weather, for example, gives decision-makers at KOC more context about the environmental issues that continually challenge Kuwait’s desert-based oil production processes. All this development is designed to place the most valuable geospatial data in the hands of KOC’s decision-makers via easy-to-understand maps. But the success of these apps depends on first having an accurate, comprehensive, and up-to-date geodatabase. And KOC finally has that. For more information, email KOC senior GIS analyst Faisal Al-Bous at fbous@kockw.com or KOC GIS specialist Nasir Osman at nosman@kockw.com. Majeed Al-Muwail is the operations technical services team leader for KOC’s operational areas in South and East Kuwait (S&EK). Faisal Al-Bous is the senior GIS analyst with the operations technical services team (S&EK) at KOC. Nasir Osman is a GIS specialist for KOC’s operations technical services team (S&EK). Fawzi Abdulrahman is a GIS specialist for KOC’s operations technical services team (S&EK). Faisal Shah is a project manager for Openware, Esri’s official distributor in Kuwait. Ahmed Saad is a GIS specialist at Openware. Scott Pezanowski is a GIS specialist at Openware.